by L. Carlos Lara and Robert P. Murphy, PH.D.
Carlos Laura and Robert Murphy have done a brilliant job explaining the need for privatized banking. While not facing the idea of using life insurance as your own private bank head on, they start by explaining the need for privatized banking, and how the idea of Infinite Banking can solve that very issue. Very good read to better understand the overall need to move money away from the federal banking system, and toward privatized banking. 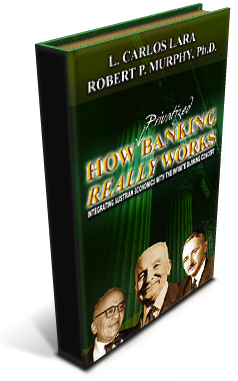 The powerful combination of Austrian Economics, The Sound Money Solution and Privatized Banking, as described by R. Nelson Nash’s Infinite Banking Concept, is the “new” idea in this book. What if there was a solution to government intervention and our current money madness? Would you hesitate one minute in wanting to know what it is? Of course not! No one would. The problem is so pervasive that a solution seems impossible and yet, there is a solution. This solution’s only requirement is the action of a single person acting in a manner to help only himself, but in so acting ultimately he helps all of society.